For the past few years, I have been making photographs without trying to tell a specific story or convey a particular message. I have simply taken candid street photos of people, situations and decisive moments that caught my eye. During this time of randomness and experimentation I improved my skills and refined my unique photographic style. Eventually I noticed that I was progressively becoming more purposeful and intentional when taking photos, and that a kind of theme or structure was emerging that linked some individual photos into a coherent narrative. It was this development that led to my decision to make a photography series. 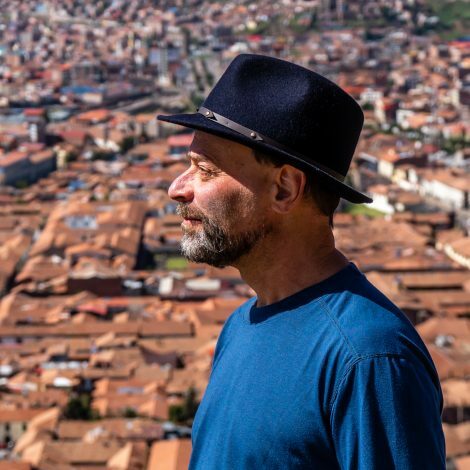 My experiences in Peru during a 2018 visit made it easy to choose that beautiful country as the subject of the series. Peru is a fascinating and dynamic country that has preserved its artistic and social traditions. I knew I would be able to make colorful and beautiful photographs that are unique and memorable. 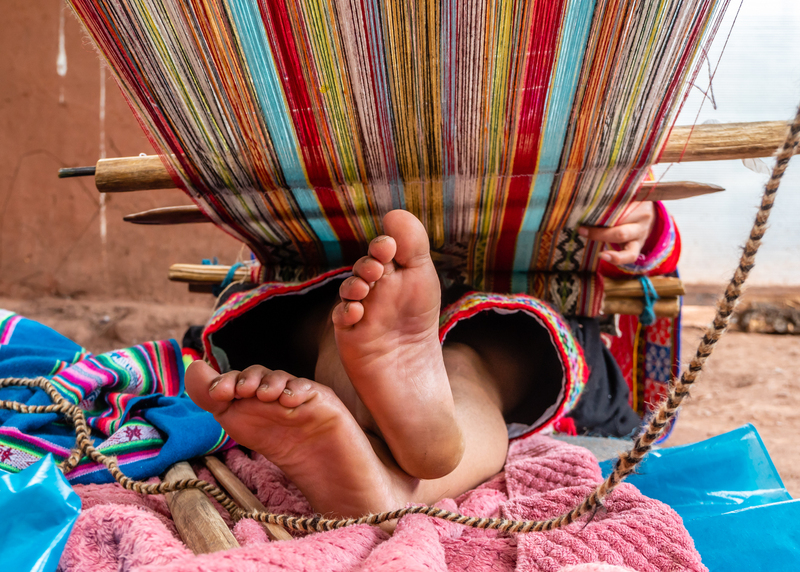 My interest was to make authentic, spontaneous photographs of Peruvians who live in the Sacred Valley, letting the shape and focus of the narrative emerge as time went on. After about a week of shooting, I noticed that I had a lot of photographs of women and children. That’s because most men were working indoors while I was photographing, and not outside on the streets. 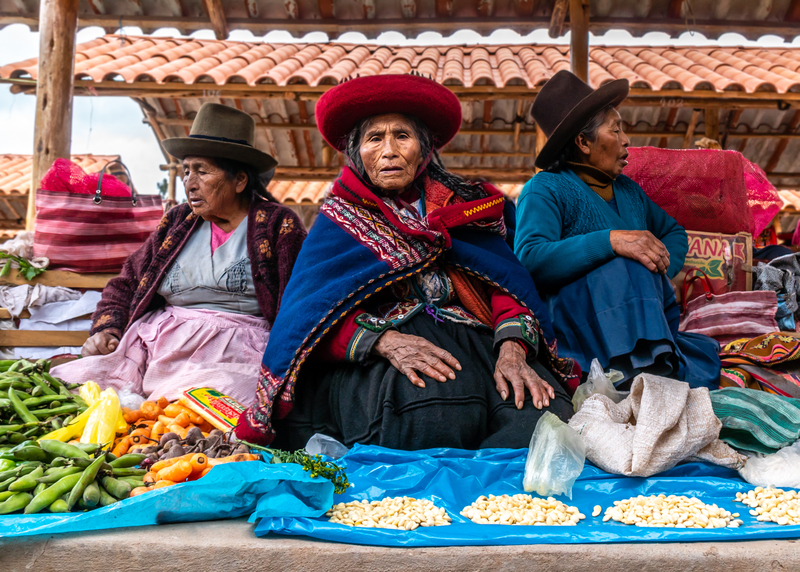 Women in rural Peru have fewer employment opportunities than men, and are less educated. 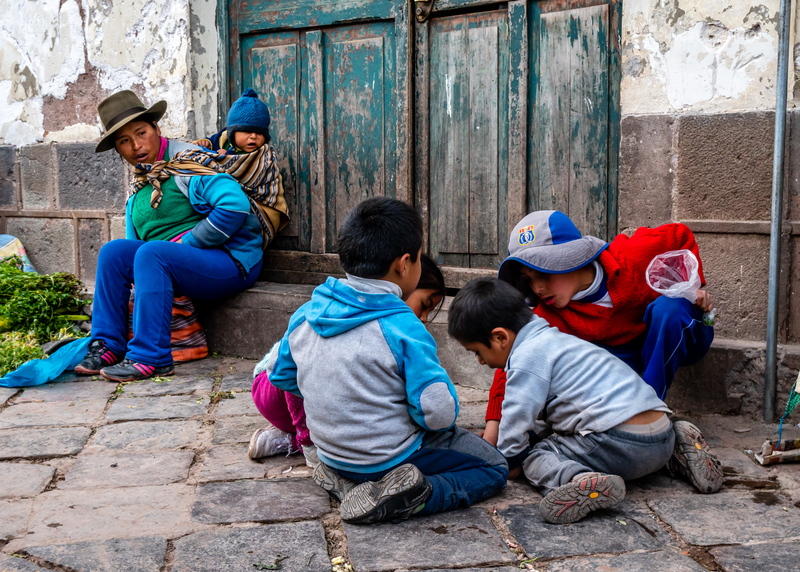 They generally take on work that does not require literacy or technical skills—activities such as making apparel and textiles, working on a farm, preparing meals, selling things in outdoor markets, and taking care of their children. In short, an emphasis on women and children emerged as the coherence that shaped my photographic work there. 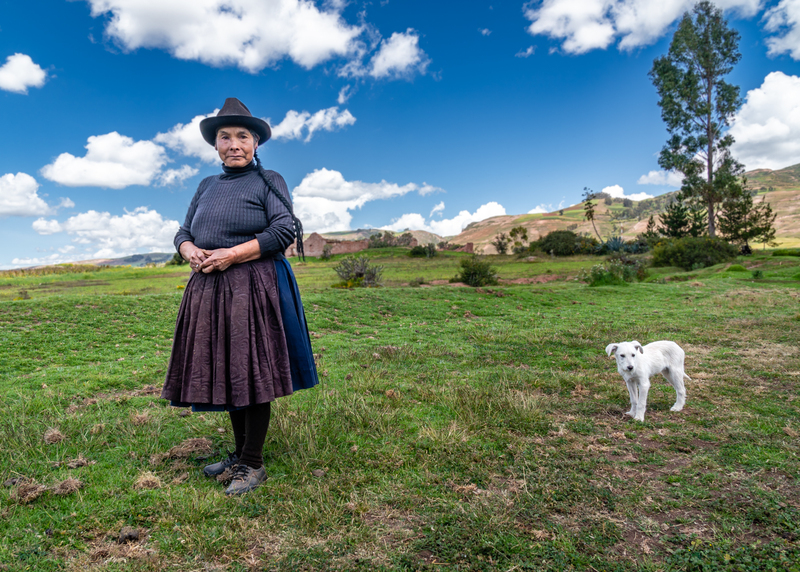 I hope you enjoy my series of photographs that depict rural Peruvian women and children in the authentic context of their daily routines. I introduced myself to this farmer as I was driving around a remote area in Moras and asked her permission to photograph the farm animals. She told me I was the first person ever to take photos of her animals and then asked me to pay her for the privilege, which I gladly did. I could not resist taking a photo of the farmer and her adorable white puppy. 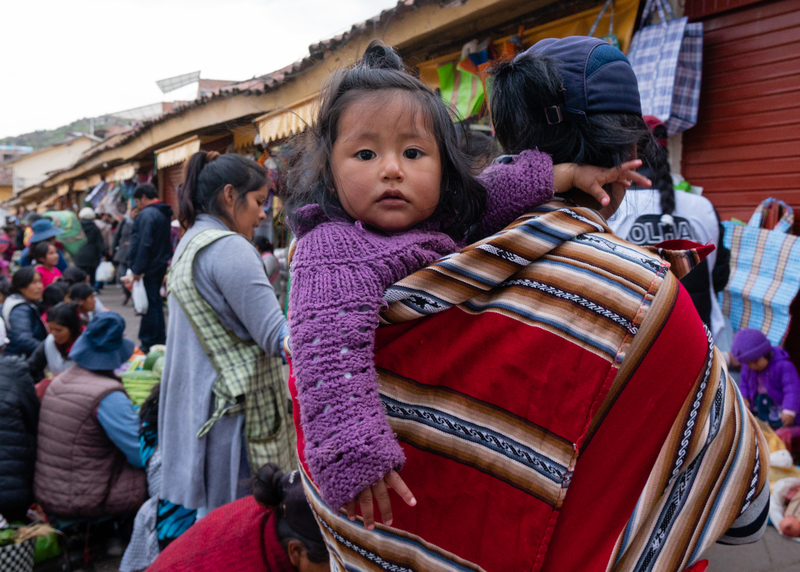 This young girl was comfortably secured on the back of her mother who was shopping at the Sunday Market in Chinchero. The young girl was very interested in me and my camera, and did not seem frightened or worried about my presence. 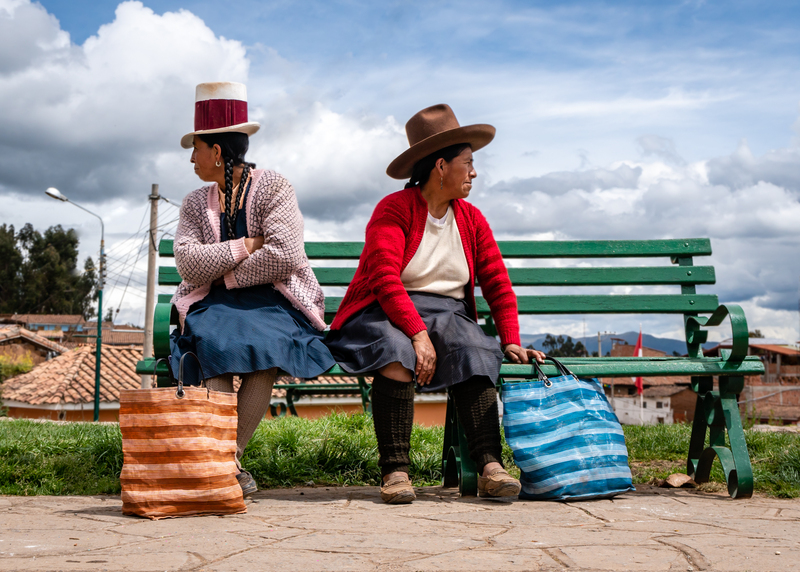 These two women shopped at the Sunday market in Chinchero and were waiting for a bus to go home. I was attracted by the opposite direction of their gazes which suggests they’re waiting for different buses. 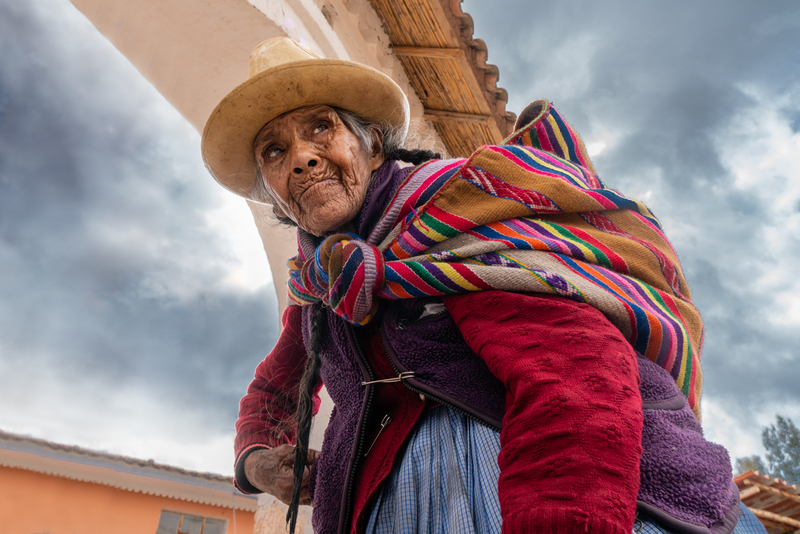 I was buying a sweet bread at the Sunday Market in Chinchero when this elder lady approached to do the same. She was carrying her market purchases on her back, as she has probably done her entire adult life. Her facial skin was tough and wrinkled from the many days spent outdoors under the sun. 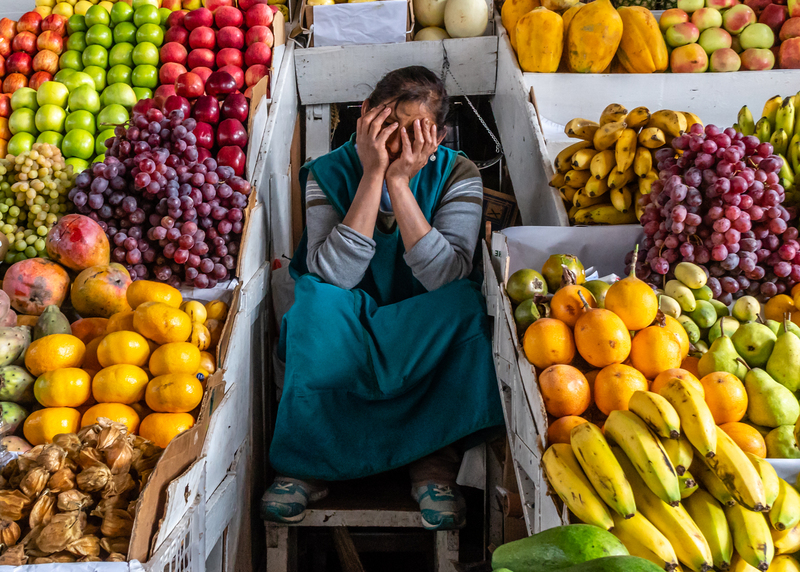 This photo was taken in the San Pedro Market in Cusco, about two hours before closing time. This woman likely starts her workdays early in the morning, and then continues working at home into the late evenings as she prepares meals and performs house duties. The market was not busy at this time and the lack of activity might have put her to sleep. 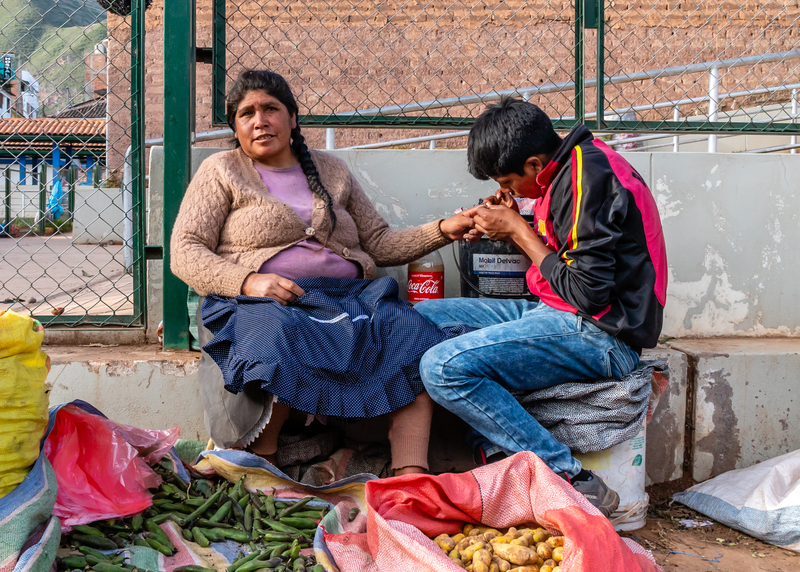 I went to the Urubamba market about one hour before closing time and noticed how this young man was tending to his mother’s hand. He was holding her hand close to his face and blowing. Was he addressing an injury or perhaps painting her nails? I could not tell from where I stood. Regardless, the mother looked very relaxed and seemed to enjoy her son’s attention. 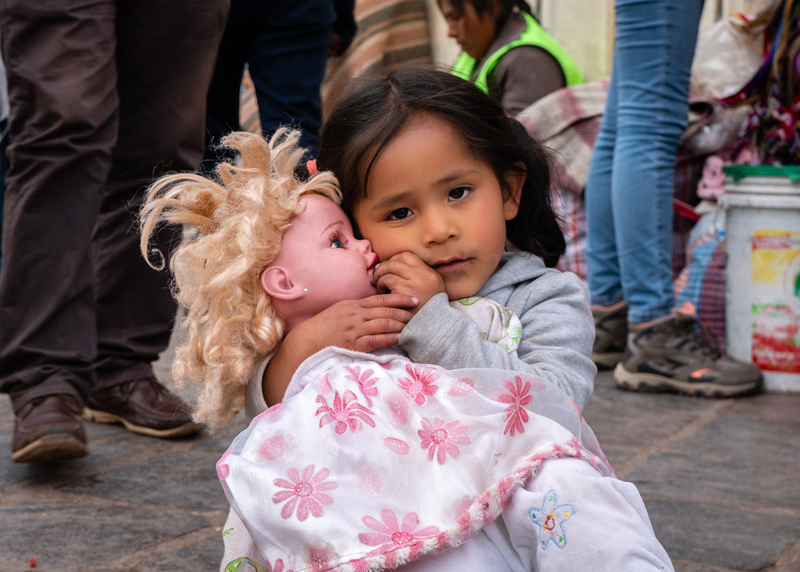 This beautiful young girl was sitting on a very busy street in Cusco and playing with her Caucasian doll. When I noticed her, she was looking at her doll, fixing her hair, and talking to her. She turned and saw that I was positioning myself to take a photo and thankfully retained a natural and soft expression while affectionately holding on to her doll, rather than trying to smile for the camera. I did not see a parent or older sibling and wondered who was watching over her. Were they shopping or working close by? I often saw children playing on the streets in busy areas without any direct adult supervision and believe that the children are safe never the less. 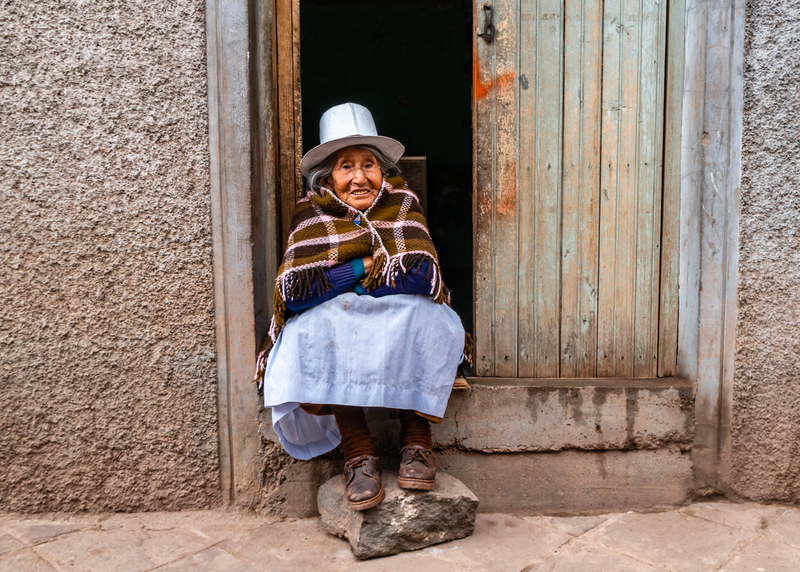 Some Peruvian women dressed in a traditional costume, and their llamas, wander around Cusco in search of tourists who are willing to pay for a photo. 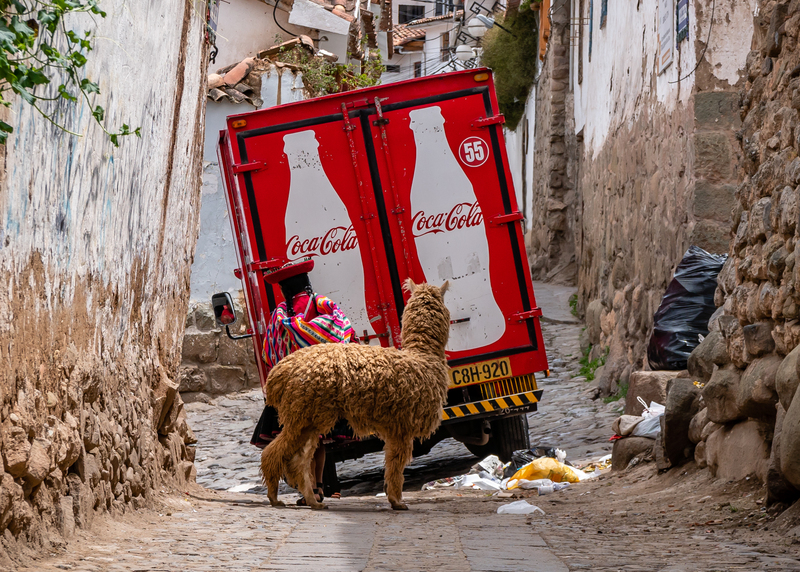 The woman and llama in this photo were patiently waiting for the Coca-Cola truck to navigate its way through the narrow streets. This scene made me laugh and I thought it would be nice to insert some humor into my photography series. I made this photo in Pisac after eating my dinner. I was walking to my car when I passed this elderly lady. After turning the corner, I stopped and decided to turn around and approach the lady to ask permission to take her photo. I offered to pay her. She did not understand my request and thankfully her daughter came out and helped me with the conversation. The lady could not believe that I wanted to pay to take her photo and that made her very happy. I suspect the next day she told all of her friends what happened. I went to a place that raised alpacas and llamas, and sold the textiles and apparel made from the animals’ hair. Several women made merchandise on premise which was part of the site tour offered to tourists. I did not want to take the usual and customary photo of a woman making a rug and decided to shoot from a different perspective. I wanted to allow you, the viewer, to try and imagine the person from looking only at the artisan’s feet. Is she young or old? What does she look like? 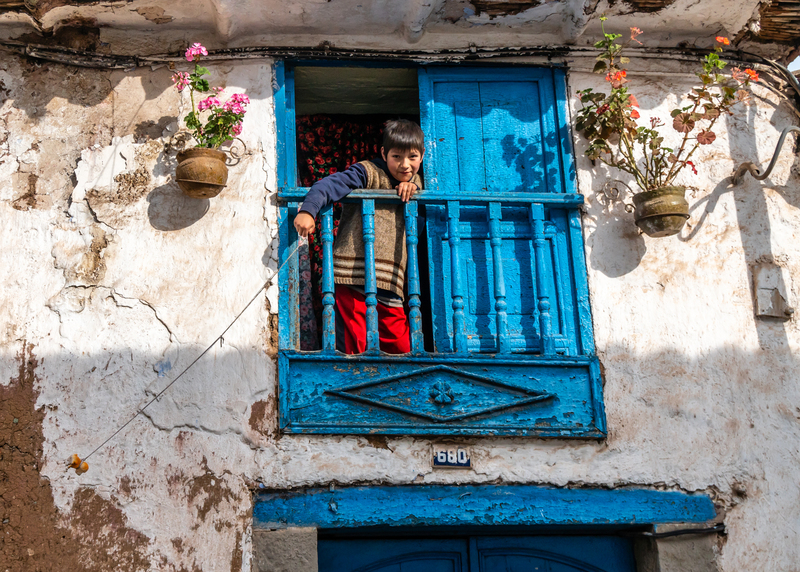 This photo was made on a busy street in Cusco. The mother is most likely taking a break from food shopping. I was squatting very close to the people in this photo and fortunately no one took notice of me. I had the opportunity to work the scene and make several frames. This photo was worth the effort. During one of my strolls through San Blas, I stopped at an intersection to watch several taxis carefully negotiate their way out of a terrible traffic jam. The streets are wide enough for only one car yet cars travel on the streets in both directions. Then I noticed the boy on the top floor swinging his dog toy on a string. His movement, the lighting and colorful door caught my eye. The last photo in my series is of a statue located in Tipon known for cuyerias (restaurants that specialize in the preparation of cuy or guinea pigs). 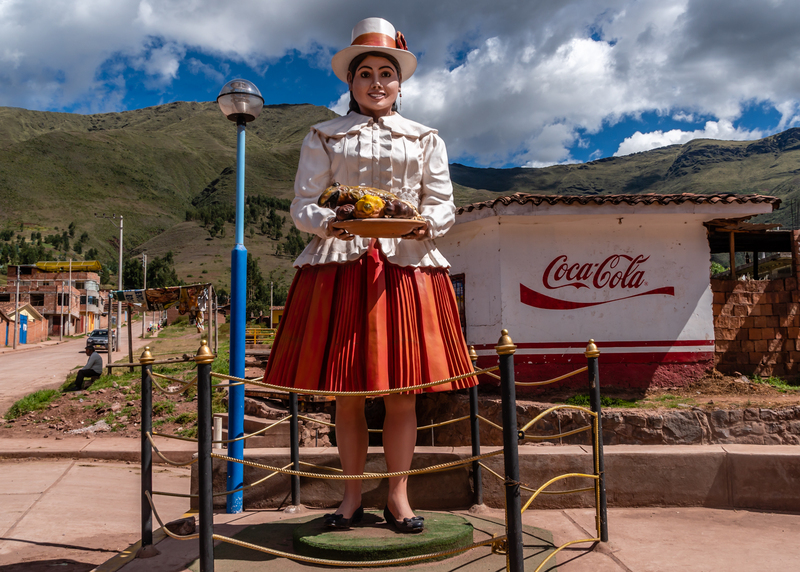 During my time in the Sacred Valley, I saw a few statues of woman wearing traditional attire while representing traditional roles. This photo is of a woman serving cuy in a restaurant and relates to my opening comments about the limited employment opportunities for Peruvian woman. Eric Davidove is a photographer who resides in the San Francisco Bay Area. He's a Californian native who began taking photography seriously after he found himself unemployed in March 2015. Eric's time spent as a street mime came in handy, giving him the ability to anticipate street moments and be there with his camera as they happen, and to take photos without being noticed or upsetting people. Eric says, "The most important thing is that I am having fun and learning something new. Let's see where this new passion leads me."